Vine’s TJ-610 Wi-Fi thermostat brings a simple design and low cost alternative to the expensive smart thermostat stage. I’ve always been more impressed with products that favor utility over flash. Give me something with practical features and durability over ultra-sleek, artful design any day. With the burgeoning Smart Home industry, there is plenty of that flash to go around, but often times not enough of the utility. As the category matures we see a division of products into two camps; those that focus on developing innovative technologies, and the brands that care more for cashing in on superficial design trends. Thankfully, more frequently we see thoughtful integration with technology that matters, and prices that are far more reasonable (or getting closer at least). One company doing away with the fluff and focusing on getting a useful piece of tech into people’s homes without charging an arm and a leg is the San Francisco-based Vine Wi-Fi thermostat (TJ-610). But is it really possible to get a Wi-Fi thermostat with functionality for around $100? 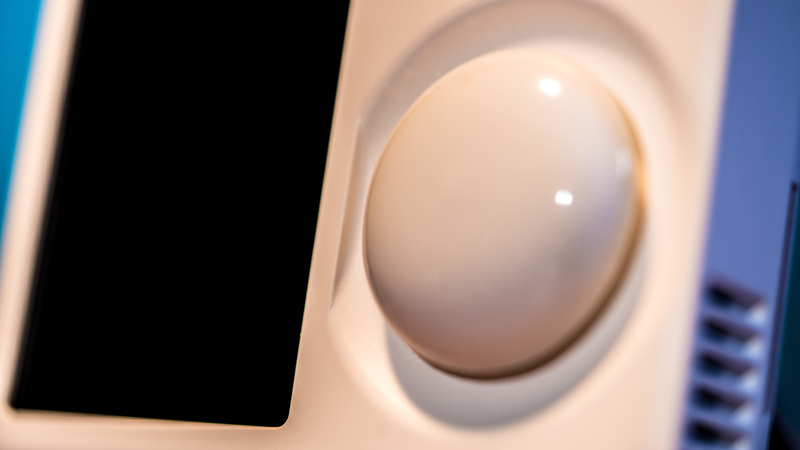 The knob dial works in conjunction with the 3.5″ color touchscreen, giving the Wi-Fi thermostat from Vine a unique (if not a bit odd) appearance. The layout of the Vine is pretty simple, while still having some modern touches. With a decent-sized 2″ x 3.5″ color touchscreen, and a subtle white plastic finish the unit measures 3 ⅞” x 4 ⅜” x 1”. The most notable physical characteristic on the thermostat is the selection knob on the face of the unit, which I’ll admit is a little confusing. Most thermostats either go with the touchscreen approach or buttons, but it’s easy to get over. Besides, the color screen looks good when illuminated, and the built-in programmable night light on the bottom of the unit is a really nice touch. In all honesty, the physical design is the least important factor for me when choosing a thermostat. While the Vine isn’t the fanciest smart thermostat on the market, it surely is not hard on the eyes and does just fine as a hallway fixture. When talking about smart thermostats, there are still skeptics who will shout from the rooftops that their $20 thermostat will do just fine, and anything else is a waste of money. Well, good for them. Having a smart thermostat is practical beyond the simple notion of having a big color touchscreen, or the concept of internet connectivity. Wi-Fi thermostats give users the ability to set programs, control temperature, monitor changes, all from anywhere at any time. Some advanced smart thermostats compatible with Amazon Alexa enable voice control, while others allow programming to kick in based on smart phone proximity to the home for immediate comfort upon arrival. The ability to have ultimate control over temperature and reduce energy use regardless of location, or changing schedule is not just ideal for personal comfort, but for those with pets as well. Vine’s website gives an interactive compatibility checker to customers before they buy. While the potential features available on Wi-Fi thermostats are plentiful, the Vine TJ-610 has some pretty useful ones selected, while unnecessary ones are left off. Aside from the app and interface features (which we will get to later), a big benefit is the flexibility to use this as a thermostat with or without a C wire, or in a variety of wiring setups. The unit doesn’t require a battery backup, and even has a four-stage programmable LED night light on the bottom. I have not seen this on other models on the market, and the utility solid considering most thermostats are placed in central portions of the home. The Vine can be used with a standard single-stage heat/cool, 1-Heat, 1-Cool, traditional furnace system, heat pump systems (with or without emergency heating), or as a Wi-Fi thermostat for heat-only or cool-only setups. The Vine TJ-610 doesn’t require a C-wire, which makes it ideal for older houses while limiting labor. The instructions provide the simple steps to convert the thermostat for these settings and all supplies. One thing to note before buying any smart thermostat is the wire requirements. 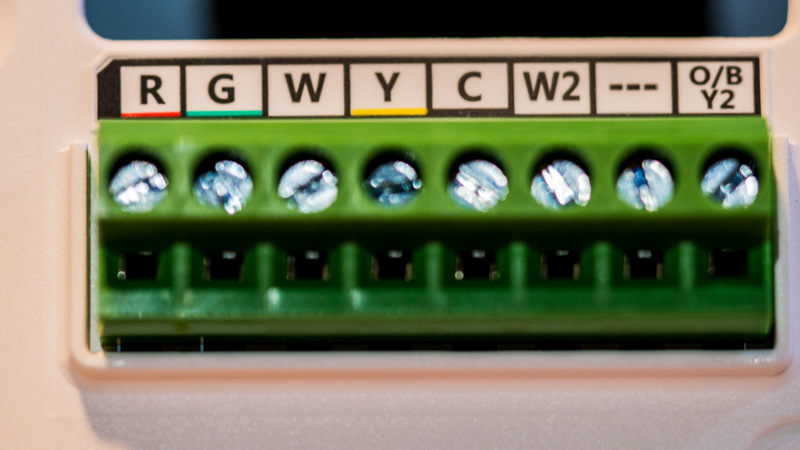 Some Wi-Fi thermostats require a common wire (C wire) for constant power on 24V AC-powered units, while others do not. The C wire runs from the furnace to the thermostat, and if the current setup doesn’t have this in place it can be a bit of a pain to install a new smart thermostat. Depending on how far the distance is between the two, and how many obstacles stand in the way, this can be a bit trying on your patience although not difficult to do. 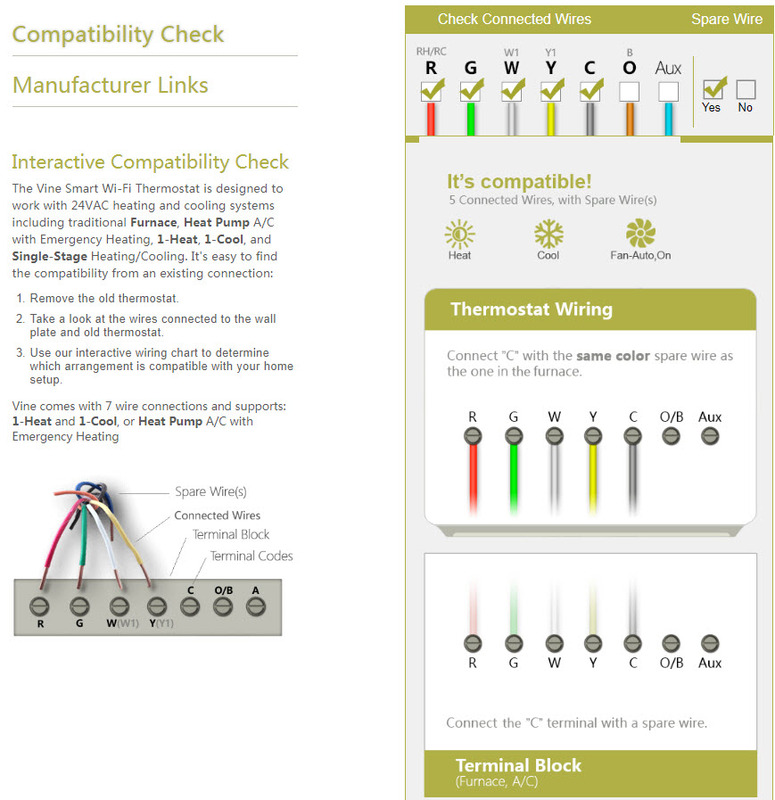 The instructions Vine provides in the manual and online are pretty comprehensive, and their Wi-Fi thermostat Help & Support section actually has an interactive web page that allows for a compatibility check before getting into the mix. 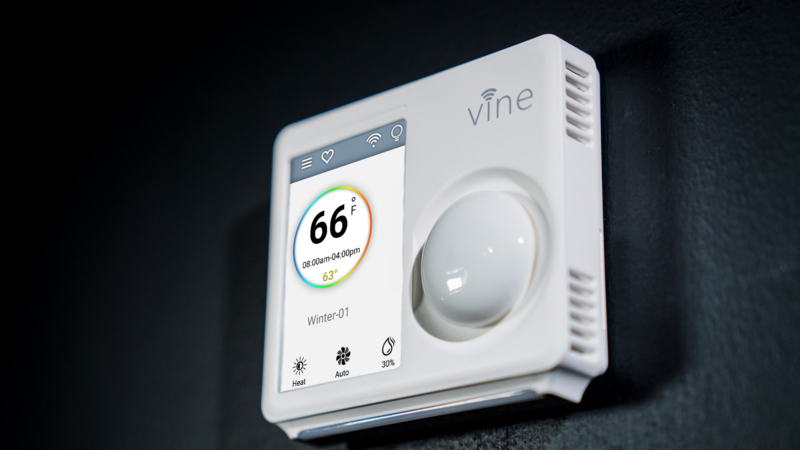 The Vine Wi-Fi thermostat can run without a C wire, which is pretty neat to avoid extra labor. If the current setup does not utilize a C wire, the instructions show how you can rearrange the wire setup to accommodate this, and even include a little jumper wire to make the adjustment at the furnace terminal. The changes are really quite simple to make, and the setup of the unit and app are similar to most Wi-Fi-enabled devices. 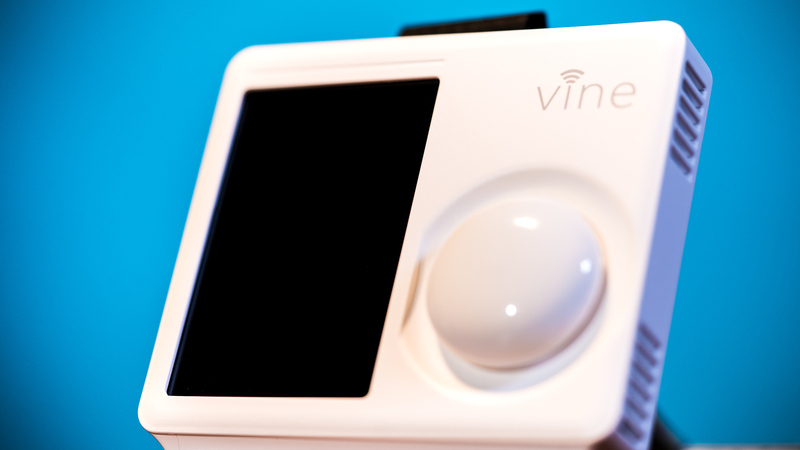 Vine’s thermostat interface is quite simple to navigate through, and the color screen is eye-catching. That knob I initially knocked for seeming out-of-place actually was useful for quickly setting the time, date, or making greater temperature adjustments, so it turns out there was a method behind the design after all. Whether in the app or on the unit, there can be seven day’s worth of individual programs; within each day there can be up to eight periods of heating or cooling. As far as I’m concerned, most people do not need to have the temperature adjust more than eight times in a day. Another neat aspec is the manual override aspect from the unit itself, regardless of the program status. While this is a pretty basic function, some of the larger smart thermostat brands don’t allow this. Vine also includes indoor humidity measurements along with zip code-targeted weather, so at a glance it serves as a mini information hub. Beyond the typical weather status, the interface displays severe weather alerts, which seem to be a regular occurrence around the country this winter. The Vine app is clean and straight forward, using the same interface as the unit itself and offering multiple options for programming. Vine’s Android/iOS app interface mirrors that of the unit itself, clean and straightforward with explanations for the more complicated settings (like emergency heating/cooling). Setting normal event programs, or even standard seasonal programs from the app is direct and takes no more than a few taps. As with many thermostats users can also set up vacation settings before going away, however being that this has Wi-Fi connectivity those settings can be changed at any time. One really unique thing that sets the Vine apart from other Wi-Fi thermostats that I have seen (and a lot of smart products in general out there) is the web-based control portal. While making changes from a smartphone is inherently simple, since I spend the majority of my day behind a computer it is easier to access the device this way. Multiple devices or users can have control to a single account, which is nice for homes with families in the event the main user is away. Since securing smart devices is a major concern in the IoT world, the Vine uses data encryption security measures to ensure that hackers can’t breach this access point to the home network. Who is this Wi-Fi Thermostat For? The Vine TJ-610 Wi-Fi thermostat is a great option for users who don’t want the high price tag for useless features, and who still want to build a smart home. All in all, it’s a solid buy for the cost. With an MSRP of $129 and often times available for under $100, this is a solid buy for anyone looking to snag a cheap smart thermostat. Spend any time searching for a connected thermostat with good features, and undoubtedly the descriptions are bloated with irrelevant functions and a massive price tag. The one thing that I think is probably one of the coolest features on a Wi-Fi thermostat these days that is missing from the Vine is geofencing triggers, which either turn on or off the designated settings when it detects the presence of a user’s smartphone nearby. While this is not imperative it is useful, but am I willing to spend an extra $100 to get it? Nope. If anyone like me is in the market for a smart thermostat that gives added control, flexibility, and provides useful applications without needing an art museum-styled contraption, the Vine TJ-610 thermostat is the way to go. Check out all our coverage of Smart Home tech and follow the latest industry and developments. Previous PostParrot Bebop 2 Power FPV Drone: Can a Fixed-Camera Quadcopter Really Have it All?